After a nerve-racking Champions League 1st-leg qualifier, Arsenal have come away with a slender 1-0 advantage to go into the 2nd-leg after Theo Walcott finished a superb cross from Aaron Ramsey in the 4th minute of play. With star players Robin van Persie and Samir Nasri out due to suspension, Wilshere out with injury and no Fabregas after his departure to Barcelona, the need for victory was evident for a team that was facing a difficult rebuilding stage. The lack of experience showed. Although Arsenal did well to keep out the Italian side for the whole encounter, it looked far from likely this would be case with Udinese threatening our goal on multiple occasions and looking very likely to score when coming up against our shaky defence, with Szczesny forced into making a few great saves he should never have had to. The performance again raises some questions over our defence which was unlocked much to easily on way too many occasions, notably with Armero who took a Sunday stroll through our defence on his way to a one-on-one with Szczesny, which the Pole convincingly saved. No doubt critics of the Arsenal defence will voice their opinion, but I feel some defensive lapses can be attributed to Song playing out of position. Even though our defence looked suspect, it must also be said that Arsenal also had golden chances to win the match, with Gervinho having a golden chance to hit a volley in the 6-yard box and Walcott looking certain to grab a brace with two opportunities of his own. The first came after a great through ball by Aaron Ramsey with which Walcott fluffed the final shot and second where in the closing stages after a perfect through ball by Gervinho he stoked the ball towards far post, only to be superbly denied by the Udinese keeper Handanovic. While it was good to taste victory, it hasn’t come without consequence as the injury plague continues after Kieran Gibbs was substituted at half-time with a hamstring injury, and his replacement Johan Djourou limped off ten minutes into the second half with a similar fate. The Arsenal squad is definitely starting to look a little thin, particularly at the back. Following the tie it has been revealed Arsene Wenger did not hold a press conference to discuss his thoughts on the match. Hopefully he will reveal his perspective on the Champions League tie at a later date. Formation: As expected by allArsenal.com the line-up was as follows. Wojciech Szczesny | 8.0: The Pole continues to impress as he was forced into multiple difficult saves after Udinese exploited our defensive frailities. Effectively the one to thank for ultimately keeping Arsenal’s lead intact. Bacary Sagna | 6.5: The Frechman, as always, was a potent threat down the flank although unusually looked a little suspect in defence, especially with his soft challenge leading up to Armero’s one-on-one with Szczesny. Thomas Vermaelen | 7.5: Had a hard task ahead of him in De Natalite, but the Belgian still put in a solid performance making key interventions as the match went on. Laurent Koscielny | 6.0: Very aggressive, although too aggressive at times giving away needless free-kicks in dangerous situations. Needs to learn when and where to restrain himself. Also misplaced too many passes. Kieran Gibbs | 6.0: Looked solid, although was caught out of position on occasions leading up to dangerous situations and made some unneeded challenges leading to his yellow card. Hopefully improvement will come with match experience. Replaced by Djourou at half-time after sustaining a hamstring injury. Alex Song | 6.0: Ineffective when out of his usual screening roll in front of the back four and it showed in defence. Looked uncomfortable on attack and on a few occasions gave away possession in bad areas. Tomas Rosicky | 5.5: Was often caught in possession and seemed slow on the ball, as well as producing some suspect final balls. Lacks match-fitness and was replaced by Frimpong in the 73rd minute. Aaron Ramsey | 6.5: Seemed one of the most composed in a rattled team. Work-rate was excellent, made great forwards runs, distribution was largely good and made a great contribution to Walcott’s goal. In hindsight though he needs to sort out small mental lapses and improve on the final ball, but am sure this will come with more first-team football. 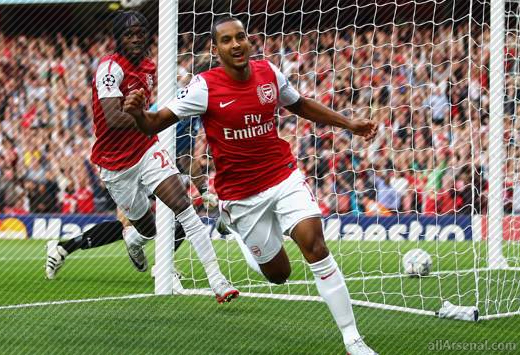 Theo Walcott | 7.0: Similar to Ramsey his work-rate was excellent but wasn’t as involved as perhaps he would have liked. Had multiple chances to win the tie for the gunners after making excellent forward runs, but perhaps needs to be more clinical although he finished well to score early. Marouane Chamakh | 4.0: One to forget for the Moroccan. Was largely anonymous and lacked movement up front. Should have been substituted for Bendtner. Gervinho | 6.5: Looked great on attack and harassed the Udinese defence, much like his performance at Newcastle. Provided a incisive ball for Walcott in dying moments but on other occasions he often lacks the final ball after charging his way into the box, but this can be partly attributed to Chamakh’s poor performance. Needs to work on final ball in crucial circumstances. Carl Jenkinson | 6.5: Considering he was played out of position in his first Champions League match it was understandable he was shaky at first, but became much more solid as the second half wore on.